Aladdin's Castle: what was it like? 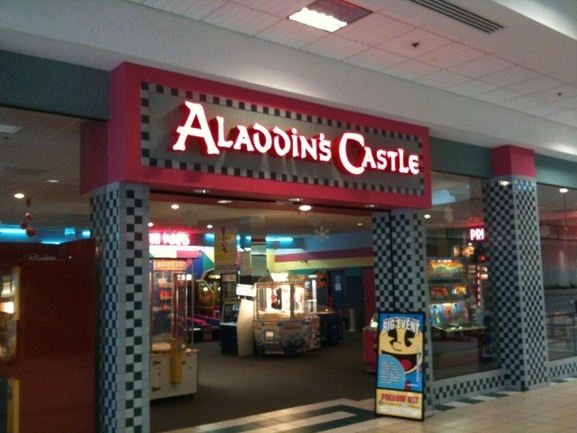 I used to go to an Aladdin's Castle in a mall in Hanford, CA in the early/mid 90s. It was sort of split into two rooms- the front was mostly ticket machines and a redemption counter, the bac kwas darker and dedicated to arcade machines. I remember encountering the first Virtua Fighter & the Holoseum there and being blown away by the graphical prowess. I also remember playing a lot of Revolution X (my sister was a big Aerosmith fan at the time.) We'd always hit the start button when we were out of token to hear the guy yell 'hey!' at us. When we moved up here to Wa state, we had a Tilt in the area. It's still here, but it's slowly shrunk over the years. Used to have it's own building, then it moved into the mall, then into progressively smaller spaces in the mall. All the machines in it are several years old- but they're also usually for sale. They put up prices at Christmastime. The good one is a place that opened a couple years ago called Round One- bowling, billiards, karaoke, and lots of shiny new machines. Quite a few import units too. The only omission is no classic arcade- but they have newer versions of several machines at ticket models. Makes me wish I was a lot better at Galaga/pac-man! That the one in Quincy? ALL redemption games? Nothing else? Used to be one at the Tippecanoe Mall. Had a couple b-day parties there. Good times! It then turned into a Sultan's Palace, where the games slowly became prize games. Still got a roll or 2 of tokens in those snazzy token holders. There is an arcade in one of my local malls full of ticket redeemers. They also have a Ms Pacman / Galaga machine, and a couple racing / bass fishing / buck hunting machines I could care less about. Honestly I've had better luck hitting laundermats and pizza parlours for arcade / pinball action. Now did you know who Cyborg was at the time? That'd complete the quintessential 80s atmosphere. In 1978, we got the Louis Joliet Mall, and I believe Aladdin's Castle was one of the first tennants. What did they have in 1978? Robot Bowl? I want to think it recently closed up. I'd love to do a road trip down there to find out. When they hit the awnings and gutter overhangs I convinced them to get me real rocket engines. And eventually I got a VCS and Apple II. And more electronics. It was now 1979 and soon enough a new obsession with Lunar Lander and modems would begin. And that was that.. Seems Aladdin's Castle was the arcade choice among girls and women. Especially when the big-hair era overlapped Aladdin's prime-time. LMAO, also known as the Cyborg era. Atari Football (with trackballs). The latter seemed infinitely complex and cool to me.